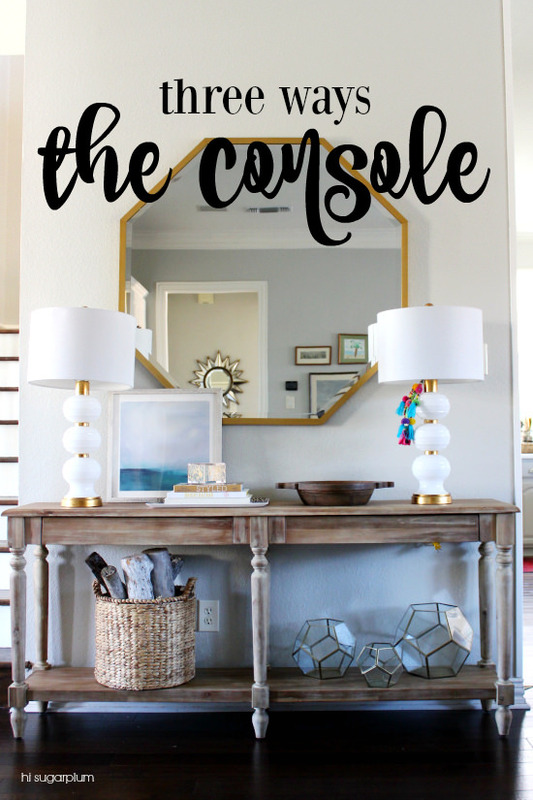 One Console | Three Ways | hi Sugarplum! 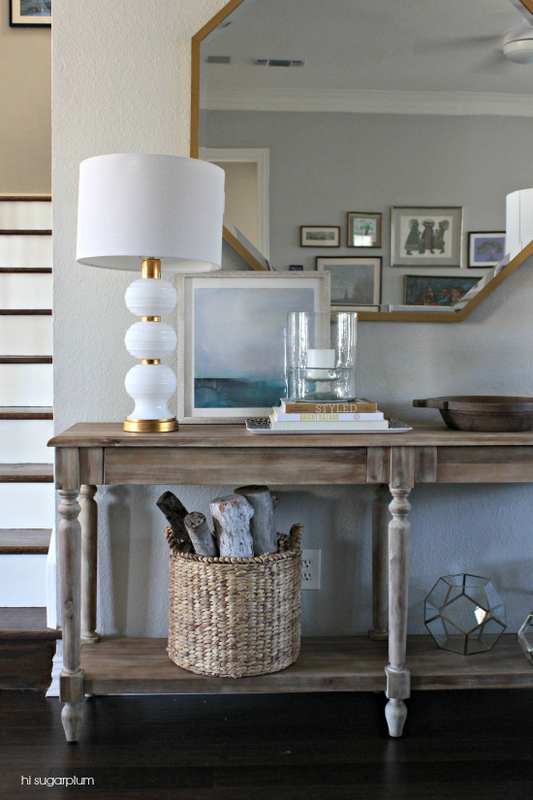 Earlier this month we hit the one-year mark in this home, and I posted a House Update showing all the progress we’ve made thus far, and the rooms we hope to tackle this year. And true to par, the new area I’m sharing today was nowhere on that list! 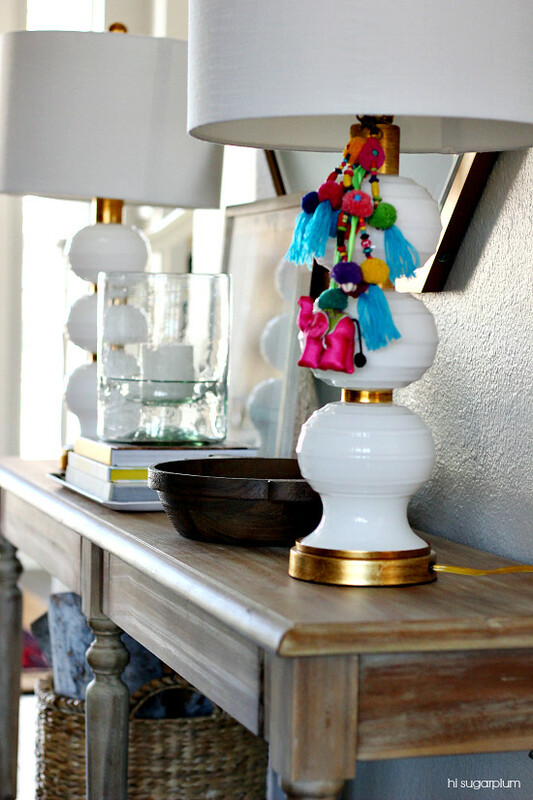 When Ikea came to makeover our Bonus Room, we shopped our house first, and several of the items that were currently in our downstairs Family Room, like the sectional sofa, Moroccan rug, and floor lamp, were moved upstairs. (This house has one more living area than our previous home, so we’re short on furniture.) So looks like we’re adding Family Room to this year’s list, starting with this partial wall that serves as connector between the main entrance and Family Room/Kitchen area. 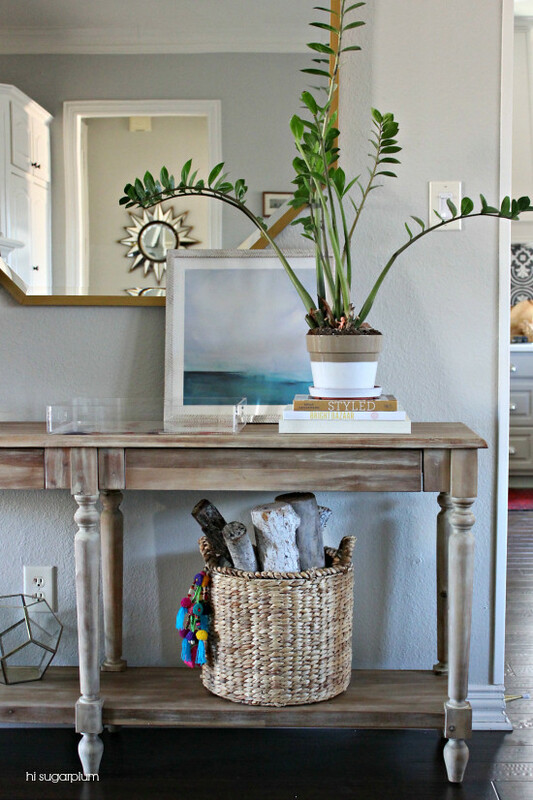 Basically, the perfect spot for a console table. 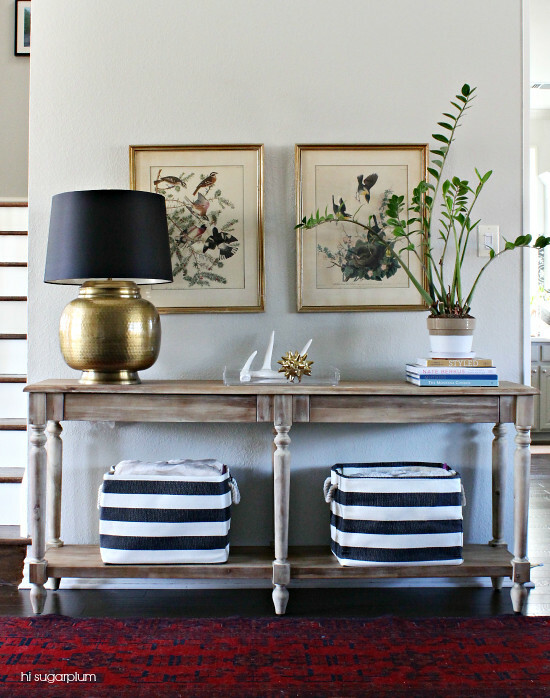 And while furniture is the bones of a room, it’s the accessories that transform it. 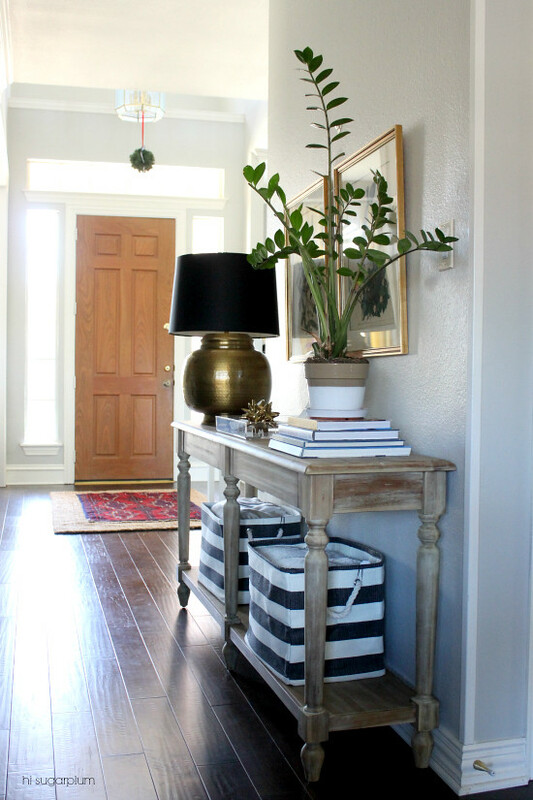 Lucky for me, styling tables and shelves is my idea of a fun time, and I spend many Saturday mornings puttering around the house, moving accessories from room-to-room. 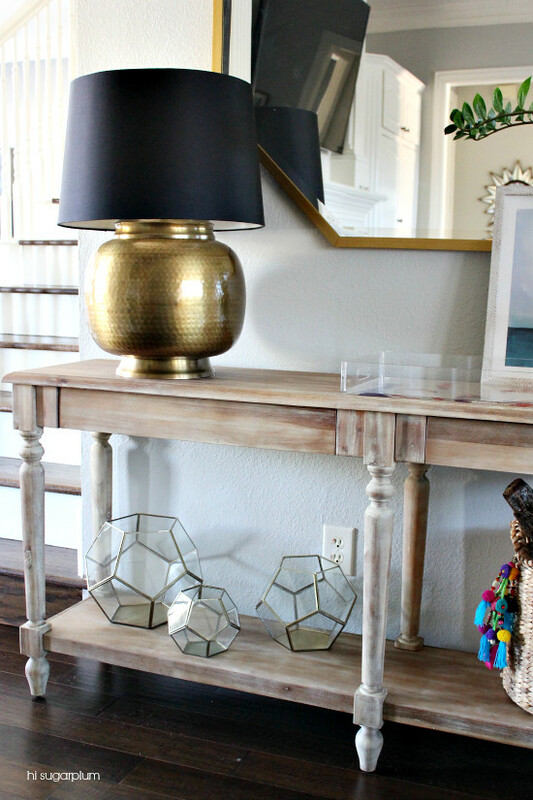 But it can also be very frustrating to find the right mix, so I thought I’d share our new console table styled three ways. 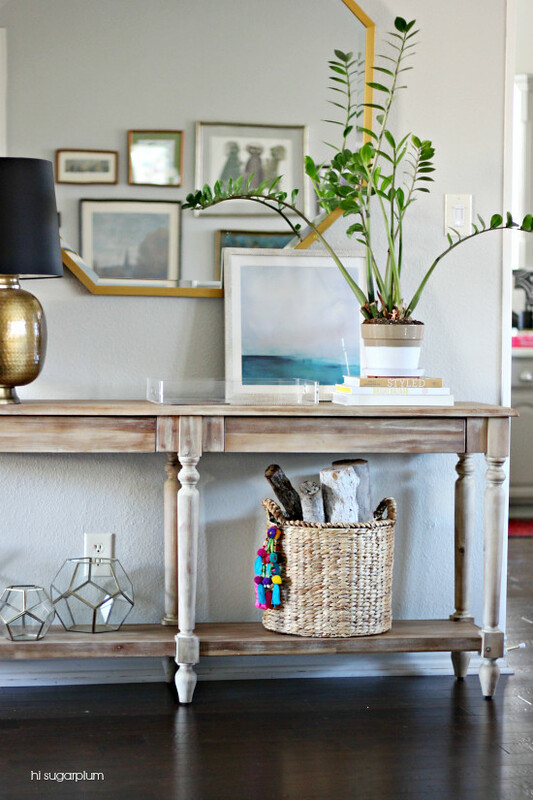 Console tables are are great multi-functional pieces, and can be used behind sofas, as small desks or nightstands (like we did here), and against walls. 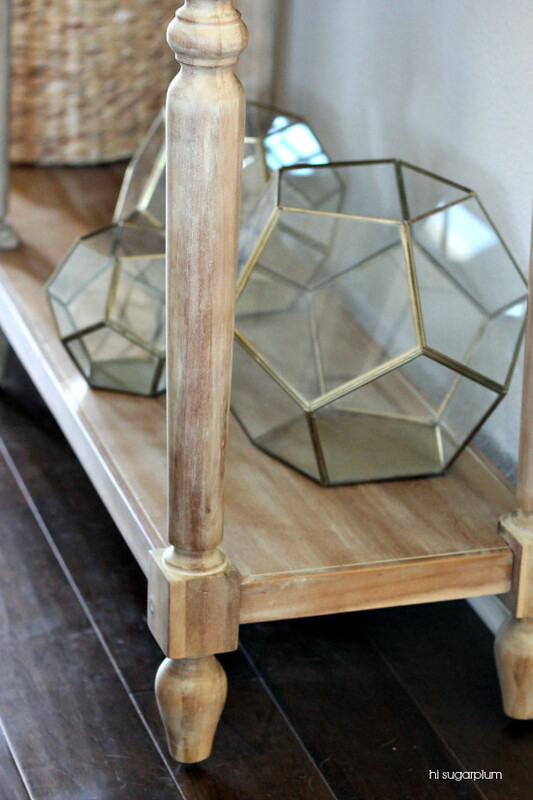 When styling them, I use a similar formula as for coffee tables, but height and visual weight of the objects play a factor, too. 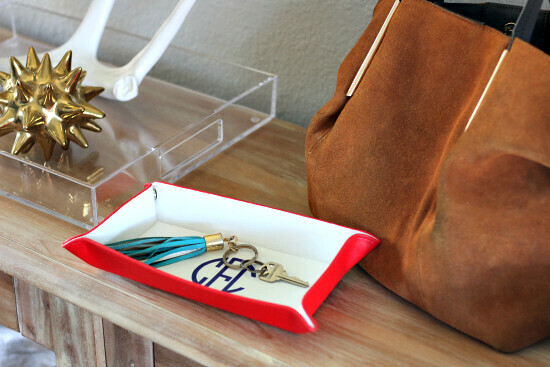 3) Quirky or statement object for personality. 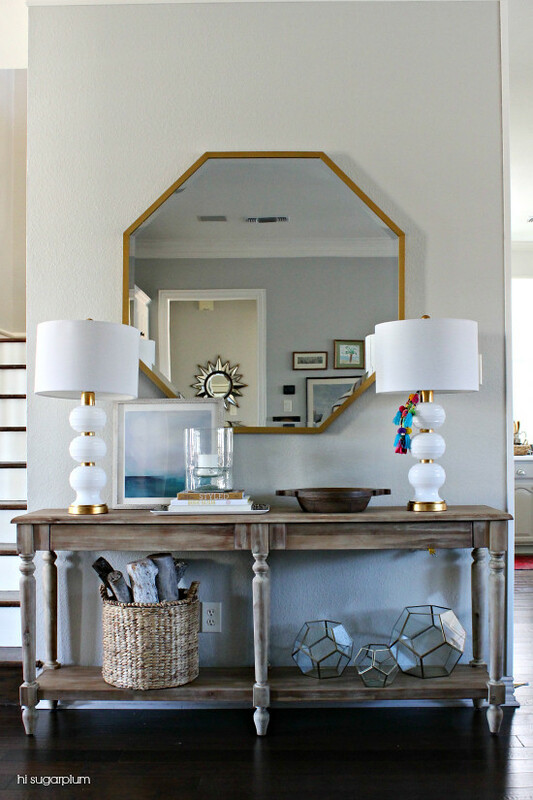 6) Art or Mirror to fill wall space. 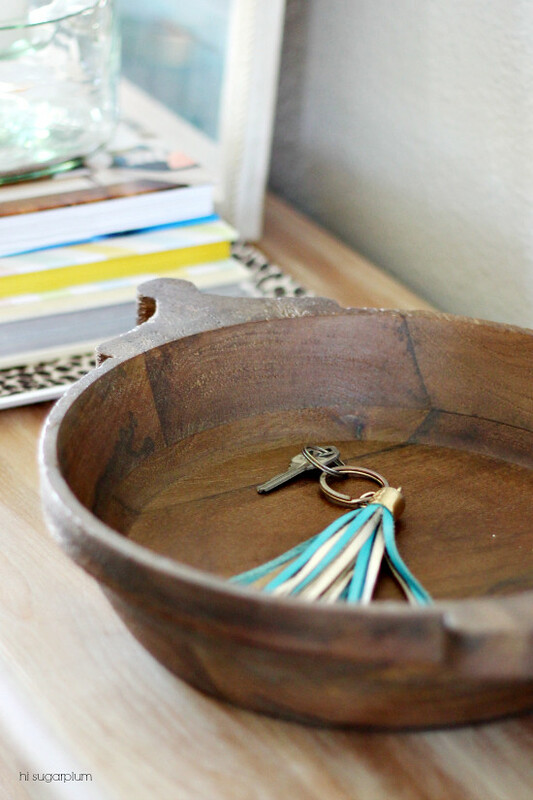 Style Tip: If your console is near an entrance, add a bowl or tray to be used as a drop-zone for keys, mail, and other daily necessities. 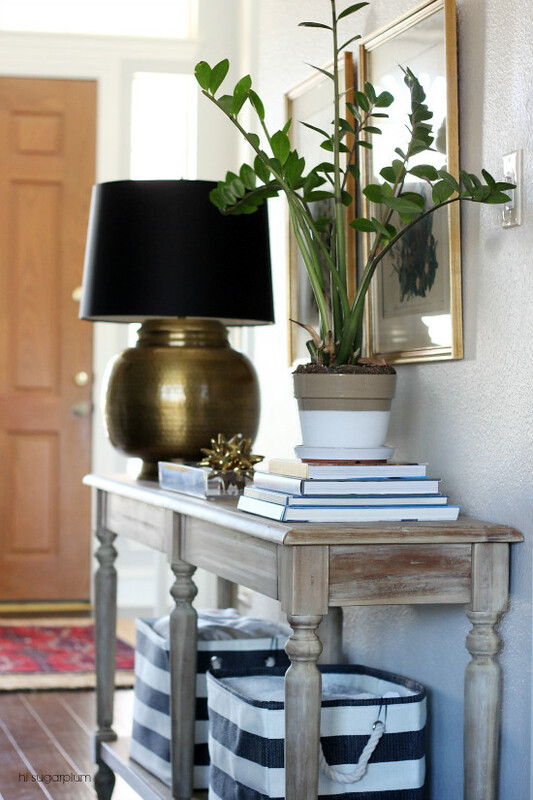 Style Tip: Large plants and tall branches are great for balancing out a single lamp. 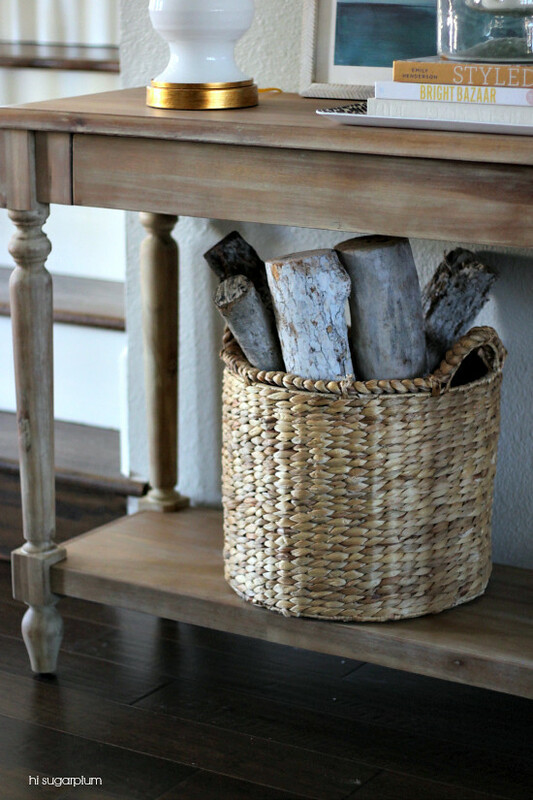 Style Tip: Baskets and bins add color, pattern, or texture to your vignette, and also stylish storage. Style Tip: Create visual balance between the shelves by separating ‘heavier’ objects to opposite ends, or grouping together in the middle. 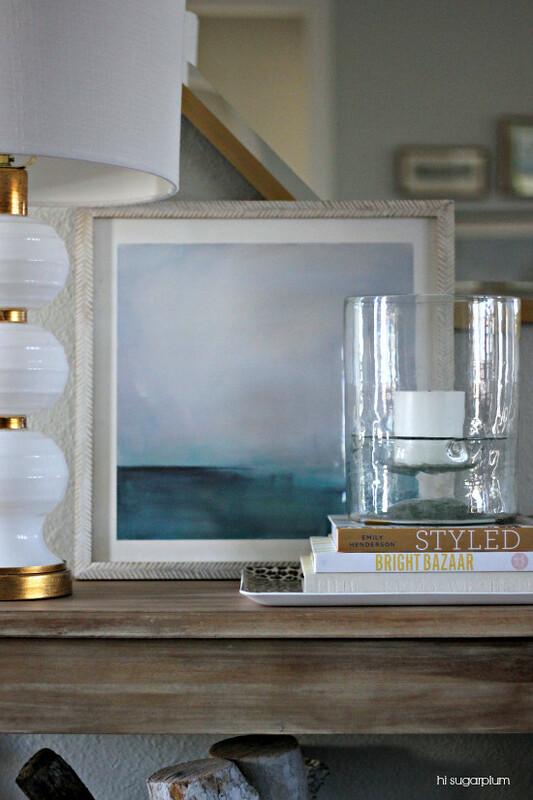 Style Tip: Add another vertical layer by leaning art against the wall. Whew, that was a doozy! But I loved every second of creating these, and could have easily done three more! Which is your favorite? 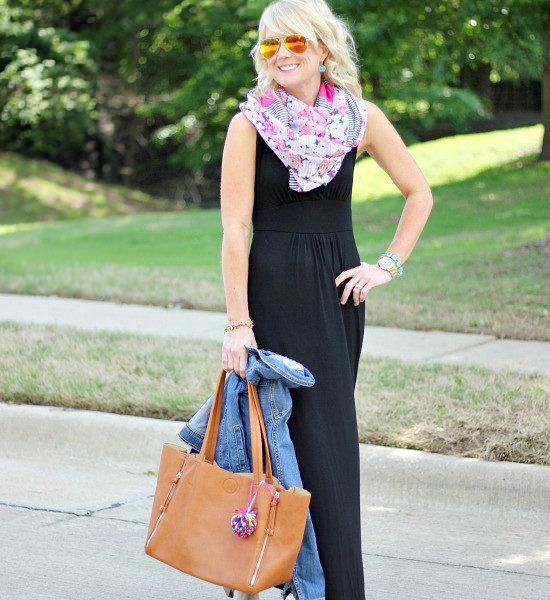 What other Styling posts would you like to see? 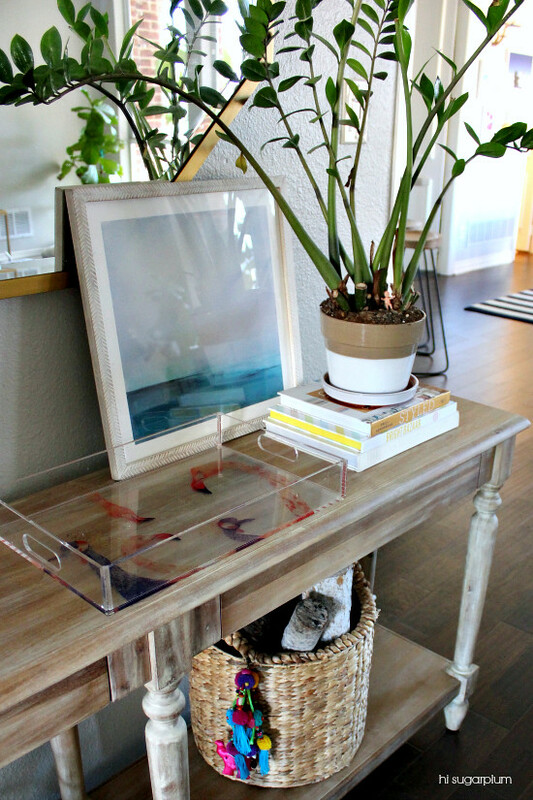 I loved all three, but the last one is what stuck…mostly because it doesn’t have items already spoken for in other areas of the house! 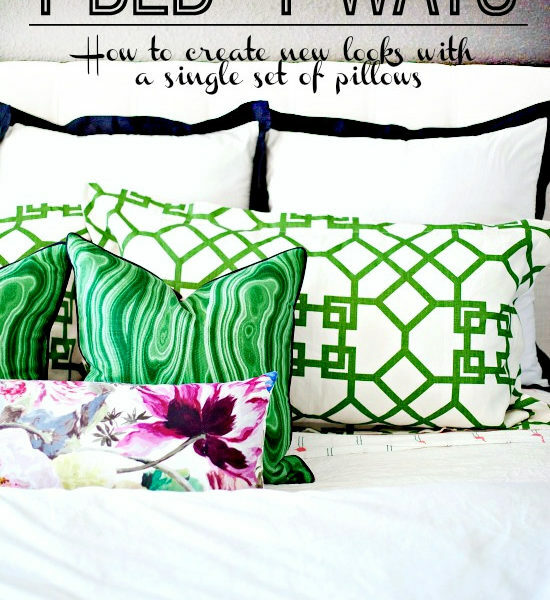 *This post was created in collaboration with World Market & Bassett Mirror Company, but all ideas, styling, and obsessive zhushing are my own. Thank you for supporting Hi Sugarplum sponsors! Okay, I love this so much!! 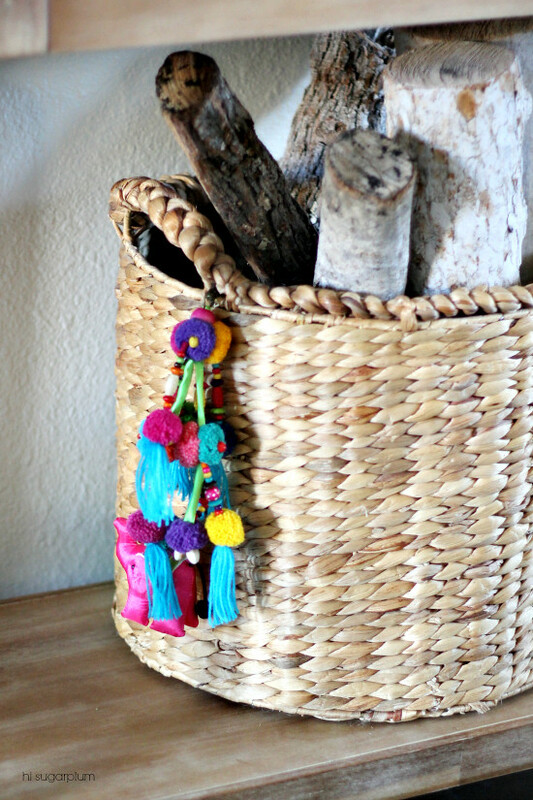 What a fun little post Cassie! Great post! LOVE those botanicals. 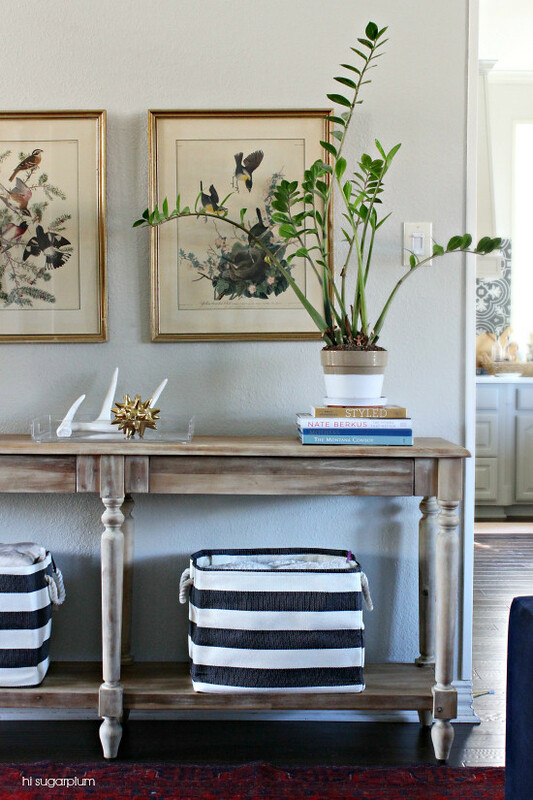 Love the symmetry of the two lamps (with the tassel)…but also love that big plant!!! I love all 3 looks! 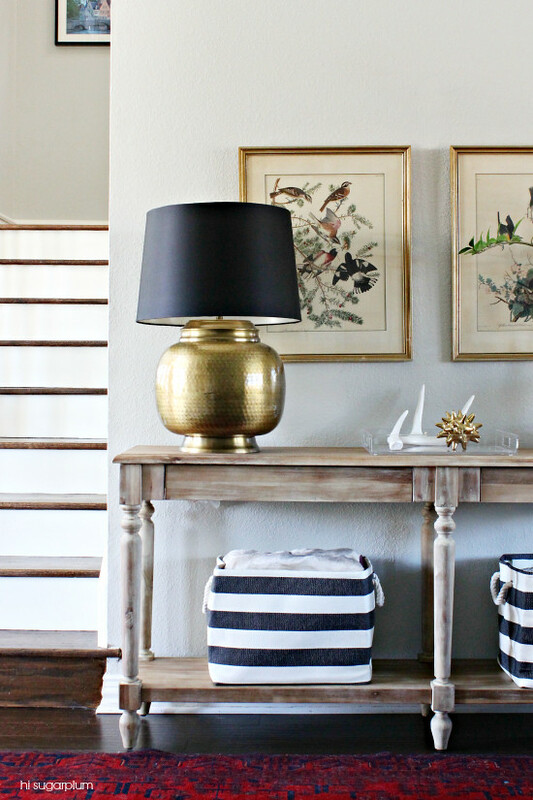 All three look really inviting but I think the lamps are what drew me to look number 1! 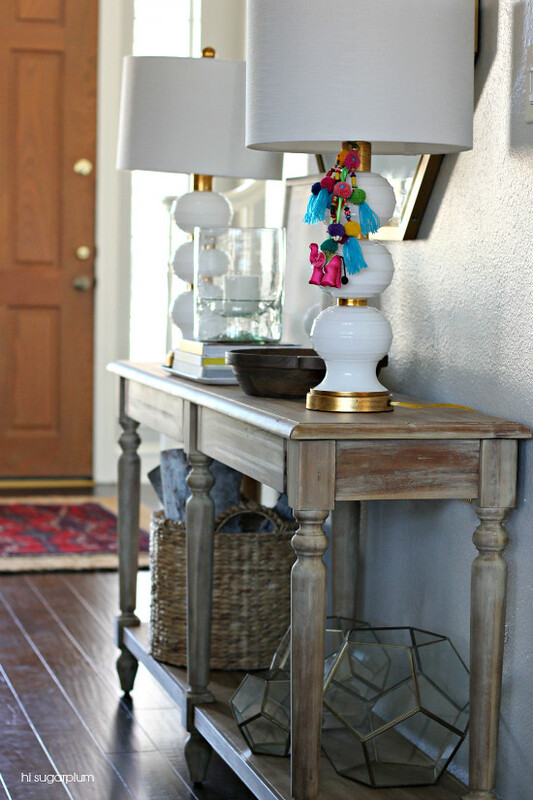 I love them all AND I got the idea of adding a lower shelf to our entry console table. So Thanks!! They are all great, but 2 and 3 are my favorite. I LOVE look number 1! 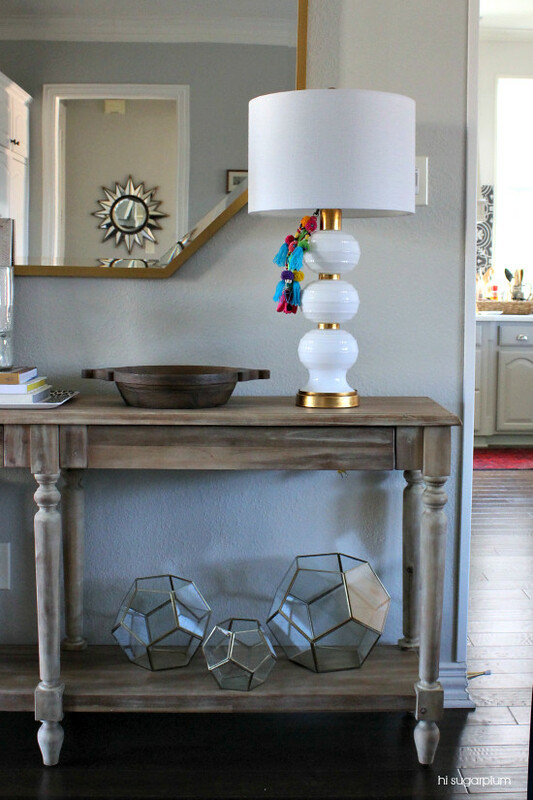 Those double lamps! 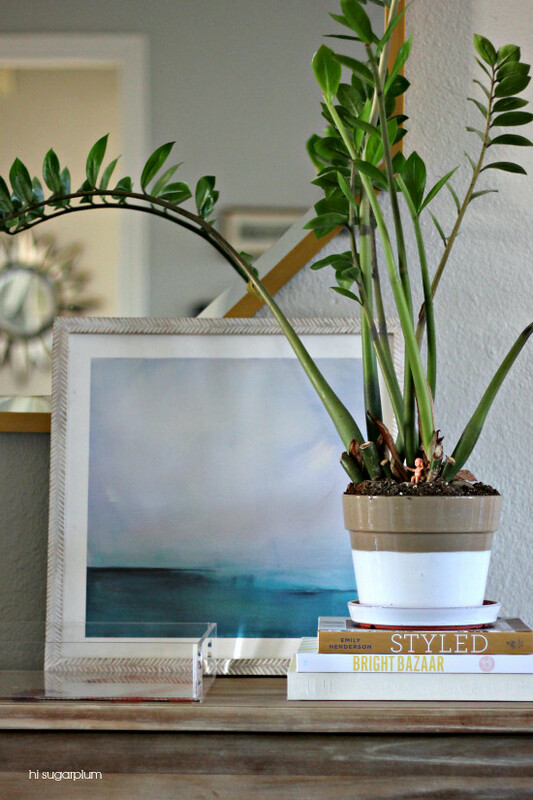 However, I must know what kind of plant that is in 2 and 3! It's amazing! I prefer the middle one. Although, I'd probably take a mixture of 2 & 3… I'd basically keep #2 but change out the pictures for the mirror. But I'd have to see to be sure. I also like for the outlets to be hidden and that bugs me in the 3rd one. I love all three of these! I think #1 is my favorite! 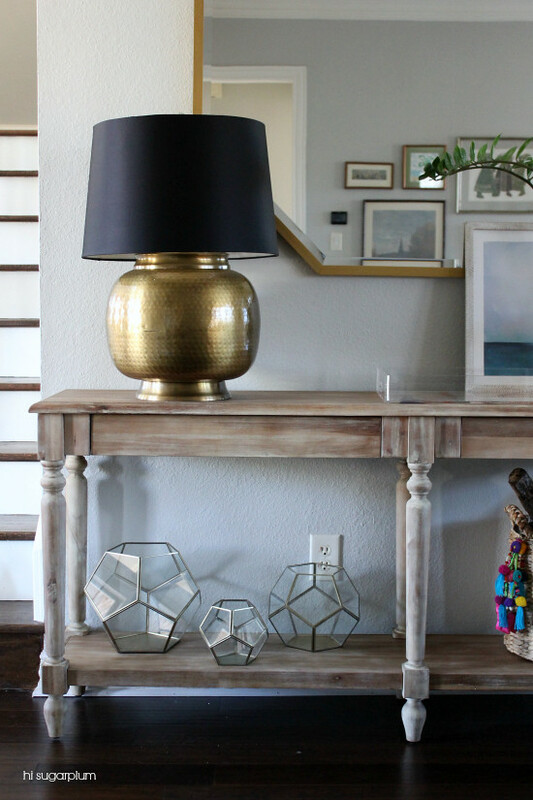 That console is just gorgeous and I love the lamps. I was going to tell you to stick with the 3rd option, then I read to the end and said, "hey, great minds think alike!" Carry on, cool cat! 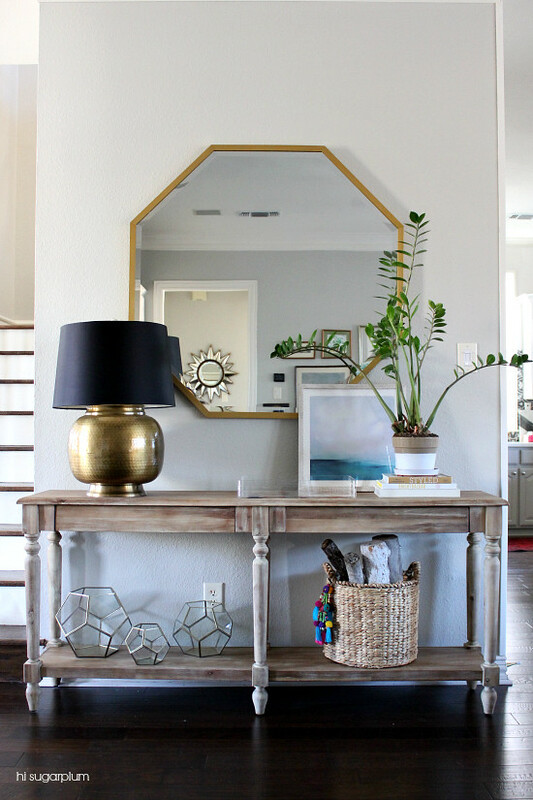 this might be a dumb question – but I see the gallery wall in the reflection: how do you get the mat borders to be the same size in each different frame – DIY or use a store? 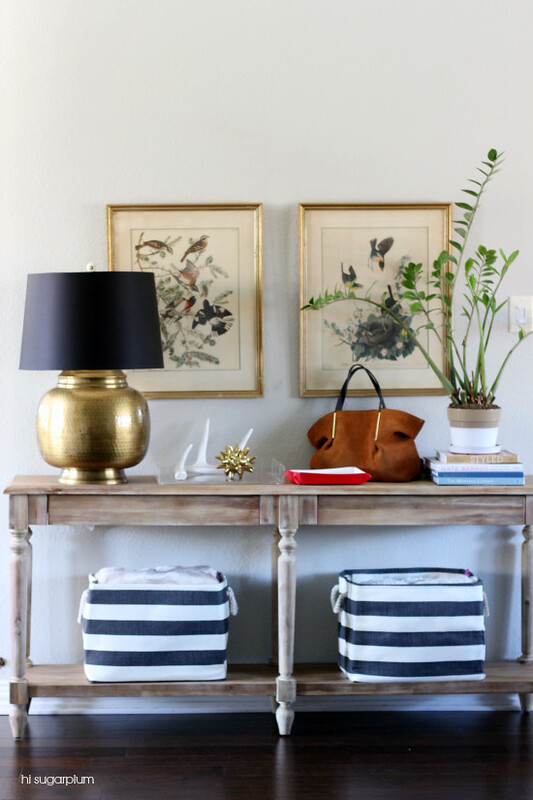 I super heart those navy and white baskets! 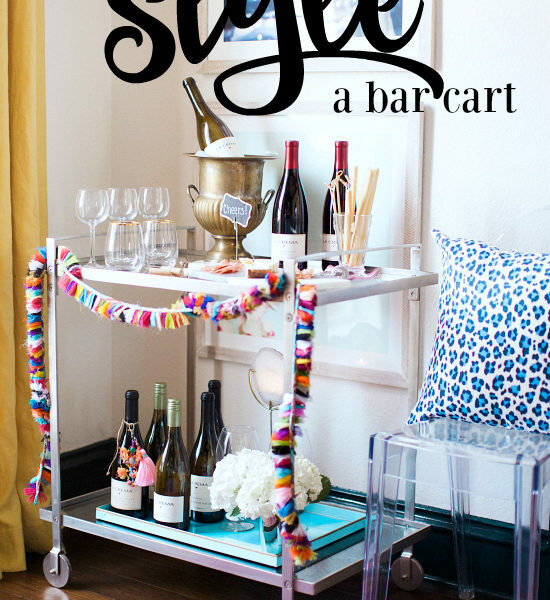 I think I love 2 the most but would want the basket and art from 3 incorporated. I swear I don't have a coastal obsession. Hi! Did you paint the table at all? I clicked the link to the WM site and it looks a bit more brown, but yours as little more of a faded look? It’s beautiful!